Yesterday afternoon, I was already thinking about having oatmeal for breakfast today, since I like to alternate between having carbs and not with breakfast during the week. I knew I didn’t want to eat apple in it again, just because it was getting repetitive, but I struggled with not having much else at home that would make good oatmeal fillings. The more I thought about it, I realized I had some canned pumpkin left in the fridge and I immediately began to ponder some sort of pumpkin oatmeal. I did some searching and I found a recipe on Peanut Butter Boy‘s website for Pumpkin Pie Peanut Butter Oatmeal. Pumpkin and peanut butter? Hmm…I decided to give it a shot. It was glorious! Not only did it taste great, but it was healthy AND I still haven’t gotten hungry for a morning snack yet. That almost never happens and when it does I need to take note and eat breakfasts like this one again. 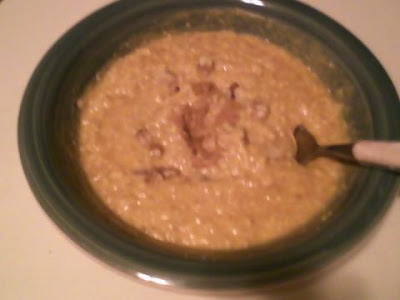 Directions: Cook oats with water, milk and pumpkin all stirred in. Remove from microwave (or stove) and add pumpkin pie spice (a few shakes) and syrup and stir again. Top with walnuts and peanut butter and more spice if desired. Entire recipe (using products I did) is 368 calories. I’m off to go plan today’s workout. Since I didn’t do any weights yesterday, I thought I’d try to get some in today. Posted on October 24, 2008, in Breakfast, oatmeal, pumpkin, recipes. Bookmark the permalink. 1 Comment.